Dodge has welcomed its final Demon into this mortal plane. 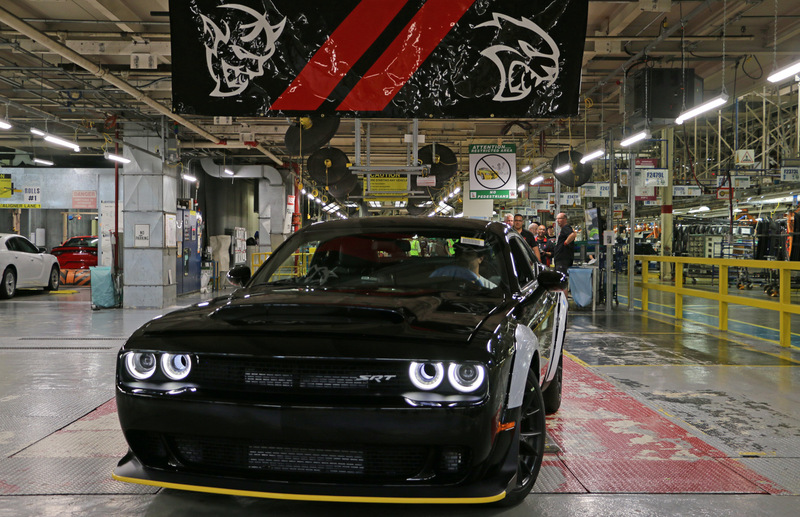 The last of the Demon line was built on May 30, 2018 at Chrysler’s Brampton, Ontario, Canada, assembly facility. Dodge set up some cameras to capture the event, so click play and watch the final Dodge Challenger SRT Demon slowly make its way into existence. The lucky owner of this particular 840-horsepower devil car has yet to be determined. That’s because the final 2018 Demon is heading to the auction block. As it rolls of the line, it wears it’s black paint quite well. The car won’t stay that way, though, as Dodge plans to have this Demon handpainted in a shade of red also found on a Dodge Viper that was the final member of its respective line. How much will the mighty muscle machine and its Viper partner fetch? Don’t be surprised if the bidding hits well over $1 million. No, we’re not smoking the devil’s lettuce on this one. Back in 2014, Dodge auctioned off the very first production Challenger Hellcat. Someone paid handsomely for that one as the car garnered a winning bid of $825,000. Now we have the final Demon auctioned alongside the final Viper? It could easily turn into a seven-figure affair. The duo will be sold at the Barrett-Jackson auction in Uncasville, Connecticut, which is set for June 20-23. All proceeds will go to benefit the United Way. The winning bidder will wind up owning (besides the Viper) a Dodge Challenger capable of running from 0-60 mph in just 2.3 seconds. The Demon is a production car that can lift its front tires off the ground when properly set up! That’s one of the coolest features of any car ever built. Dodge built only 3,300 examples. Here in the States we received 3,000 of that lot, while our friends in Canada got the remaining 300 units. All we ask of the future owner is that he or she please remove the yellow packing material that Chrysler applies to the car. For some reason, there’s a weird trend for Hellcat and Demon owners to leave the yellow stuff on the lower trim. It looks silly. It’s like leaving the sticker on your new hat because you think it looks cool. Literal spoiler alert: It doesn’t.